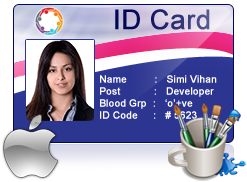 MAC compatible ID Card Maker Software generates ID cards for students, employees, visitors and other people. Program provides advanced print settings to print designed ID cards on MAC. Mac ID Cards Maker (Corporate Edition) is useful for designing and printing ID cards in different shapes including rectangle and rounded rectangle. Software helps MAC users to create list of ID cards using batch processing feature. For creating customize ID cards, Mac ID Card Design Software provides various card designing objects such as line, text, rectangle, ellipse, star, triangle, barcode, watermark, image library, signature etc. You can print multiple ID cards using flexible print settings. Mac Student ID Cards Maker Software provides Live Group and Batch Processing mode to create ID cards for group of students using excel file data. Program provides option to add image, barcode, signature, watermark, and text on ID cards. Mac Gate Pass ID Cards Maker Software quickly creates and prints visitor ID cards. Software helps MAC users to design gate pass ID cards for visitors and also maintains visitor records by adding visitor details to the database. You can crop images for visitor ID cards using Image Cropping Tool.